In just a few weeks, the sweet, tangy scent of barbeque will drift over Arlington as the 17th Annual Arlington BBQ FallFest gets underway in Douglass Street Park on October 18-19. Over 40 teams from across the mid-South will compete in two divisions, Pro and Challenger, for trophies, cash prizes, and–maybe most importantly–bragging rights. 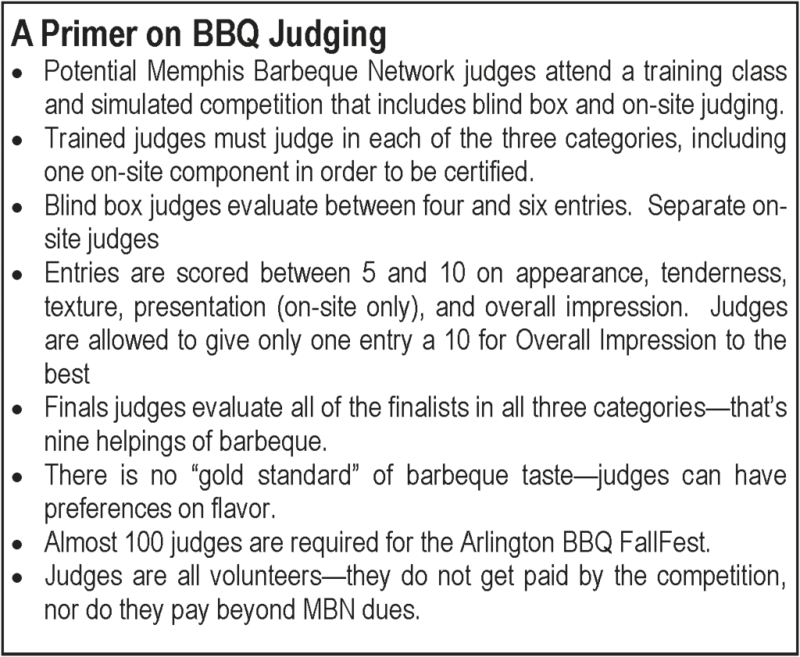 Across the country, barbeque contests are serious business—the Arlington BBQ FallFest is sanctioned by the Memphis BBQ Network (MBN), which means that the judges have been certified by the organization and that certain guidelines are met. The team application this year includes five pages of “Official Rules and Regulations” ranging from the weight of a whole hog entry (85 lb. minimum), to type of fuel used (wood and charcoal only), to whether garnish is allowed on the “blind box” rib entries (no). At each competition, teams earn points toward “Team of the Year” and an invitation to the MBN Championship in March. In case you’re wondering, around here, barbeque contests are all about the pig. Pro teams can choose to compete in Whole Hog, Shoulder, and/or Ribs. The Challenger division, for teams and head cooks who have not previously participated at the Pro level, consists of two categories, Ribs and Pulled Pork. 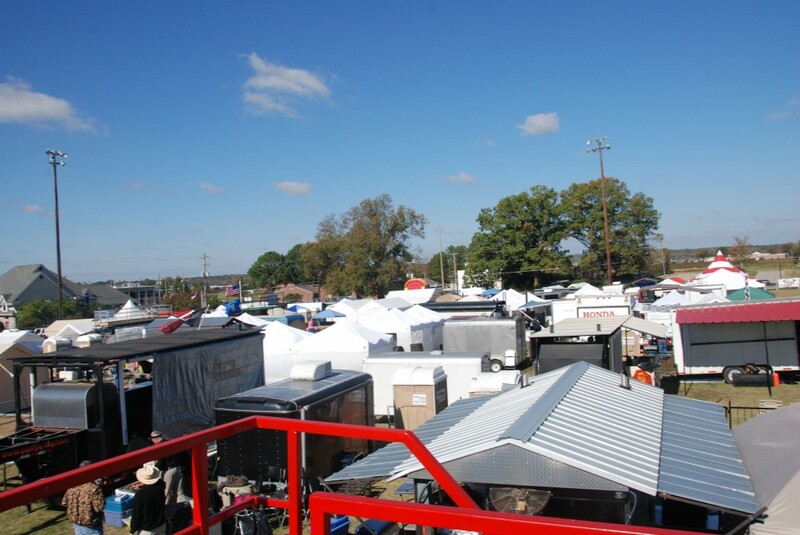 The Arlington BBQ FallFest, like most competitions, includes ancillary contests which are affectionately called “Anything But Pork”, and can range from traditional BBQ accompaniments of sauce and beans to the more exotic desserts and seafood. With judging for these categories on Friday night, they are a fun preview to the main event on Saturday. And some of the top teams in the MBN have 38002 connections. Last month, I sat down with members of Sweet Swine O’ Mine and FN’A BBQ to learn more about competing and judging. 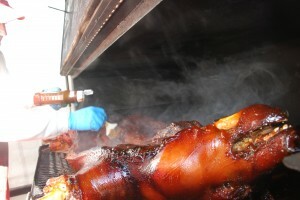 Arlington residents Chris and Malou Culver joined established Pro team Sweet Swine O’ Mine (SSOM) in 2009, when the previous hog cook moved to Mississippi. The couple had been Ambassadors for that year’s Memphis in May World Championship BBQ Contest, and had several friends on the team. Chris, who by day is Director of Industrial Sales for an electrical equipment supplier, had no experience in competitive barbeque cooking. “We set up in our cove, cooked all night, and in the morning he told me that he thought I had it down,” Chris laughs. Since then, he’s taken that basic knowledge and improved on it. As the hog cook, Chris is responsible for turning roughly 150 pounds of raw, unprepared hog into mouth-watering deliciousness that will ultimately be judged bite by bite. In 24 hours. With only wood or charcoal. And usually in a parking lot or field. For Chris, it starts with the meat. As a Pro division team, SSOM benefits from having a meat sponsor that furnishes all of its pork. He uses a grass fed Duroc hog, which is a premium breed known for its high percentage of intramuscular fat (marbling), which Chris feels gives his hog more flavor. Cooking a hog for competition is more of a marathon than a sprint. First comes an official meat inspection, during which the meat is checked that it has been properly refrigerated and not pre-cooked, sauced, spiced, marinated, or treated in any way. After that, the team spends a couple of hours butchering and trimming the hog, and then flavoring it before placing it on the grill. Chris explains that for a 9:45am Saturday morning “turn-in” (more about that later), the team would have the meat inspected Friday morning and start prepping afterwards, about 10:00am, to get it in the cooker by noon. He will then check the meat every few hours—all day and night—to have it at the peak of readiness about 30-45 minutes before judging. 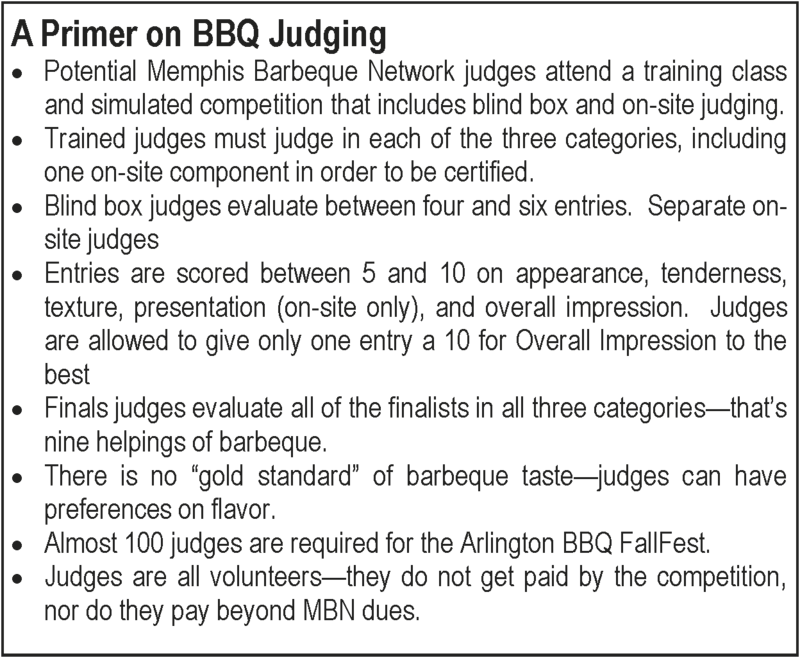 In the Pro division, all teams have two different preliminary scores: “blind box”—meat arranged in a provided container and delivered to the judges tent, where it is evaluated by three to four judges on appearance, taste, and tenderness. This is immediately followed by 15-minute “onsite” visits by three different judges. Chris explains that as soon as the blind box is prepared for turn in, the team goes to work cleaning, polishing, and garnishing the site to make it as appealing as possible. Garnishing and presentation are Malou’s specialty, and teams typically pull out all the stops for this critical step. China, silver, placemats, flowers, table decorations —the works—all add to the atmosphere. On-site judges are required to see the meat on the grill before tasting and the cook delivers a detailed presentation of the cooking methods, flavors, and secrets used. A quick five minutes to reset, and the next onsite judge arrives for a repeat presentation. Meanwhile, remember that many teams compete in more than one category, so while Chris is focused on his on-site judges, his teammates are busy with cooking the ribs. The top three entries in each category proceed to finals. Chris laughs that when the finalist notification arrives, the team “high-fives and gets back to work.” The final round consists of another on-site judging presentation, this time by a group of four judges, although each scores independently. Preliminary scores are discarded, so the pressure is on. Sweet Swine O’ Mine knows all about Grand Champions—the team won that recognition at the 2013 Memphis in May World Championship BBQ Contest for its Shoulder entry, earning it national recognition and an invitation to compete in “The Jack” (Jack Daniel’s World Championship Invitational) on October 26th and in the seven-team, $50,000 winner-take-all Kingsford Challenge this November in New York. In the barbeque world, firefighter Bill Scott, a nine-year veteran of the Arlington Fire Department, and his wife Karen, Marketing Director for Malco Theaters are known for organizing one of the top teams in the Challenger Division, FN’A BBQ. 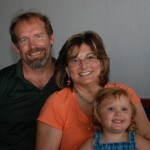 Bill doubles as the rib cook and Karen handles finances and logistics for the team. Arlington residents Jack and Claudia Woods, Michelle Mynatt help round out the team, with Jack as the pulled pork specialist. Like many team members, the Scotts started out helping with a neighbor’s team and then “got bit” with the barbeque bug about eight years ago. In addition to cooking for competitions, Bill helps mentor younger teams. But don’t be fooled into thinking that just because they aren’t called “pro”, the Challenger teams are any less serious about their “Q”. While entry fees and meat bills are generally lower (a whole hog can easily set a Pro team back $300), Challenger division still requires hefty investments of money and time. One of the things Bill has seen with barbeque competitions is the growing importance of having a scientific approach to flavor, quipping that cooking has come a long way from setting up a tent and grill and having a good time. His goal is to build a “flavor profile” with his rubs, injections, and sauces that includes transitioning from salty to sweet and timing how far ahead to make them so that the flavors develop. Even the type of wood used will make a difference. Apple wood, for example, leaves a much-desired visible “smoke ring” in the meat. As with the Pro division, Challenger teams first submit their ribs and pulled pork entries in a “blind box” to a panel of judges. Only the three finalists, however, are judged onsite to determine the winner. Bill admits that his background as a firefighter helps with an understanding of the effects of weather, temperature, and humidity when cooking outside in a changing environment. And so far, the team’s work has paid off. FN’A BBQ is currently in third place in the MBN Challenger Team of the Year standings and has won two Grand Championships so far this year. Friday Night is Community Night—come and enjoy Grand Theft Audio onstage from 6:30 pm – 10:30 pm (FREE!). 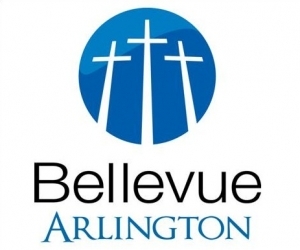 The Arlington Chamber of Commerce will be selling BBQ sandwich meals, including beans, slaw, and a drink. Cost is $10. Foodies around Memphis (and the nation) are beginning to take notice of Northeast Shelby County. This spring, local burger joint Off the Hoof Burgers was awarded the first 5-star rating ever by BestMemphis Burger.com and followed up this feat with its selection the next month as #30 in eater.com’s nationwide “38 Essential Burgers” list. 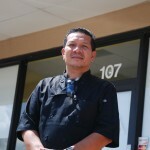 And with this new awareness of Arlington and Lakeland as a “food destination”, is it any surprise that restaurateurs Toui and Manila Praseuth, chose to relocate their Emerald Thai Restaurant to Lakeland after 18 successful years at its Mt. Moriah location? Toui (pictured below left) explains that their loyal customers from East Shelby County promised to follow the couple to the suburbs if they moved to a safer location. His wife’s sister had introduced him to Lakeland and he truly fell in love with the site on Hwy. 64 across from Krogers. The Praseuths project October 1 as their opening date in Lakeland. The 60-seat restaurant serves authentic Thai food and will offer dine-in and carry –out options in a family-friendly atmosphere. While Pad Thai (stir-fried noodles with peanut sauce) is easily Emerald Thai’s most popular dish, Toui confesses that he loves to bake and hopes to explore adding catering, delivery, and pastries in the future. A long-time Arlington favorite returning to the local food scene in town is Mayo’s Burgers and Wings. While the original location on Chester St. has been closed since 2007, owner Dionne Mayo has recently reopened near ATC Fitness on Airline Road. Featuring burgers (naturally), and wings (of course), everything on the menu is cooked fresh to order. A Value Meal features a choice of two—burgers, wings, or fish—for those patrons having a difficult time deciding. 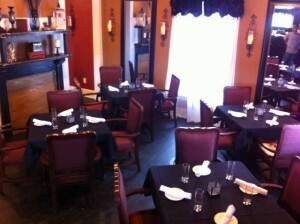 Mayo’s is open Monday-Sunday for lunch and dinner. Jackson’s on the Square owners Keith and Jenny Haynes decided on their New Orleans-inspired menu for two reasons—there’s nothing like it in this areas, and, most importantly, it’s food that they enjoy eating. Located in a historic house, the cozy rooms and fireplaces of the 50-seat restaurant give it the feeling of a French Quarter Bistro. Focusing on healthy and fresh selections, everything on the menu—sauces and desserts included—is made from scratch. Keith comments that the only time the fryer is used is to make Fried Green Tomatoes and Beignets, worthy uses for sure. Currently open Wednesday—Sunday for dinner and dessert only, Jackson’s plans to add Sunday Brunch later this Fall. Other future offerings include the development of an event venue in the space behind the restaurant and, with the onset of cooler temperatures, a Happy Hour with music and oyster roasts in the backyard. Few, if any restaurants, in 38002 have generated the Facebook buzz associated with the opening of Taco Bell in the Exxon Travel Plaza just south of I-40 at Airline Road. Situated in the space formerly occupied by Back Yard Burgers, the Tex-Mex fast food restaurant is owned by RGT with General Manager Timial Hopps (above center). Hopps came to the Arlington store just months after opening the chain’s Southaven, Mississippi location in October 2012, experience that she said paid off in the store’s busy first few weeks. The Arlington location is currently open Sunday—Thursday from 10 am—12 midnight and on Friday and Saturday until 2 am. Hopps states that Taco Bell is currently testing a breakfast menu “FirstMeal” in its California stores and planning to introduce it nationwide in early 2014. Building on the success of their award-wining Off the Hoof Burgers, Ron and Kathy Files (above, right) were hard at work with a pint-sized “helper”—grand-daughter Winona—one Saturday afternoon moving in tables and getting ready to decorate their new fish restaurant, Off the Hook, just a little west of the burger place on Hwy. 70 in the old GameTime space (more about that latter). The Off the Hook menu will feature seafood dishes ranging from fish and shrimp tacos, to Po’ Boys, fried catfish, and baskets. Blackened and grilled fish will also be available. The 100-seat dining room will continue much of the laid-back, family-friendly feel of Off the Hoof with plans for a chalkboard wall and video games. Cup discounts and loyalty rewards will be honored at both locations. Off the Hook plans to open in mid-August 2013 on Monday—Saturday for lunch and dinner. 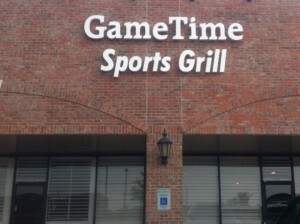 At the beginning of June, GameTime Sports Grill & Wings owners Bryan and Teresa Cochran made the big move, all the way from one end of the Arlington Collection Retail Center to the other. Now at the western end of the strip, the new location offers more open space in the dining room and a covered outdoors patio. And the move has been good for business as patrons investigate the new space. While the décor has not been finalized, fear not—the televisions are already on the walls for sports fans. Teresa plans to introduce new menu items in the next few weeks and the restaurant is hoping to add liquor to its current beer-only offerings. 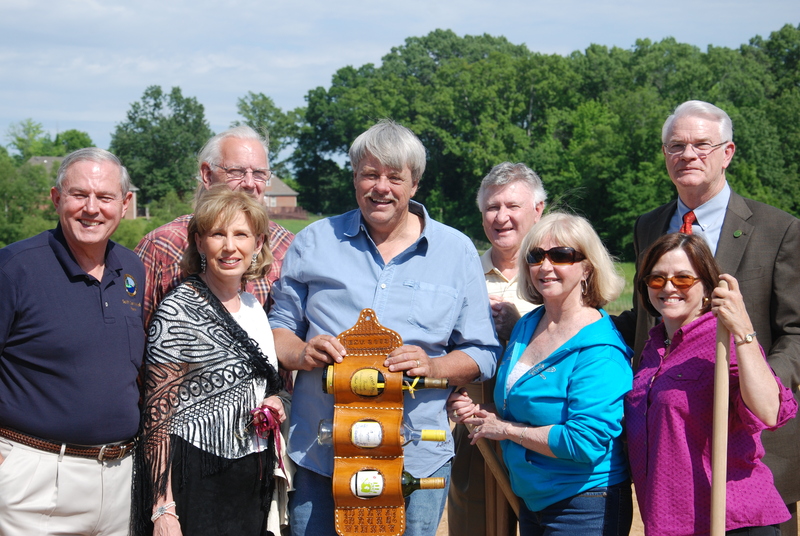 Also pictured (from left): Lakeland Mayor Scott Carmichael, Commissioner Jerry Mickie, Vice-Mayor Cecil Tompkins, owners Sheila Zaricor-Wilson, and Dianne Day, Shelby County Mayor Mark Luttrell. This is what happens when you let your friends join you on your skiing holiday honeymoon. Then you go on THEIR honeymoon to San Francisco, and, of course, you have to drive up to Napa Valley and Sonoma. Then this is where you discover how much you all enjoy the whole wine country experience—tastings, music, food. So the next fall, you return with three more couples. And then you decide that you want your own vineyard. Or, at least, that’s what happened with four of the partners in the new Delta Blues Winery, which broke ground on May 13 off Stewart Road in Lakeland. Long-time Lakeland residents Ed Stevens and Dianne Day, along with Jim Wilson and Sheila Zaricor-Wilson, fell in love with the idea of starting a winery and creating their own great wine, but quickly realized that California land was out of their budget. The group then turned their focus to regional wineries. Jim, who along with Sheila has a part interest in Crown Winery in Humboldt, explained that Tennessee has a long history of wine-making. Prior to Prohibition, the Volunteer State ranked second in the nation in the number of wineries. Currently, there are 50 wineries in the state, but only a handful in West Tennessee. “People think that you can’t grow grapes in this part of the country,” Day explained. “We plan to change that perception by making good wine.” This spring, 1,000 vines—an assortment of five varieties—will be planted on 2.5 acres that slope down to a 9-acre lake. The winery expects its first productive harvest in 2015. The 2014 harvest, Wilson said, will be for “playing,” as the vintner Ed Stevens experiments with different blends before bottling. Right now, the vines are “heeled in.” That means those vines are waiting until the vineyard’s soil is ready before replanting in their final home. Most of the grapes come from New York’s Finger Lakes region—Chambourcin, Chardonel, Traminnette, and Cayuga—with one Missouri grape, Norton, added to the mix. Those 1,000 vines are expected to produce 3 to 4 tons of grapes per acre, which will result in 750 bottles of wine. For those unable to wait two years, Delta Blues Winery will begin to bottle wine using Tennessee grapes from other vineyards this fall. Soon construction will begin on the winery building itself, which will include a tasting room and gift shop, and a separate 300-seat event venue overlooking the vines and lake. Expected to open to the public in November 2013, the winery will host weekly events geared towards families and music. Planned are “Wine Down Fridays,” an opportunity for families to bring picnics, purchase Delta Blues wines and Tennessee cheeses, and enjoy music on site. Wineries are a “low-key way of life,” Wilson said, and as a working farm, the partners want to keep a family atmosphere and build ties with the local community. Wineries are also big business. Tennessee wineries average 40,000-plus visitors each every year, according to Ginny Dunn, Economic Development Coordinator for the Lakeland Chamber of Commerce Within five years, Jim Wilson anticipates that Delta Blues will have an economic impact of $1 million to $2 million dollars. Small wonder then, that the May 13 Ground Breaking attracted government officials, including Tennessee State Representative Ron Lollar, Shelby County Mayor Mark Luttrell, along with Lakeland Mayor Scott Carmichael and Vice-Mayor Cecil Thompkins. 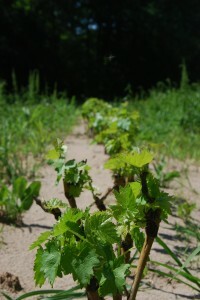 Grapes “heeled in”, waiting to be replanted. Stephanie Kerlin didn’t set out to become the matriarch of an award-winning culinary family. 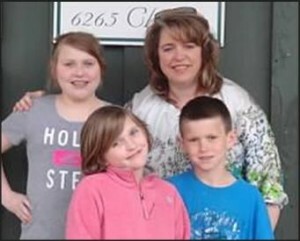 In 2011. she picked up a brochure for the annual baking contest sponsored by the Arlington Senior Citizens Center on a whim, thinking that it would be fun for her kids to enter the children’s division. It was only when she realized that her daughters, ages eight and ten, would have to bake their creations without any help from her, that panic set in. “I will tell you, it was very hard that year, but I sat at my kitchen counter and watched each of them make their own entry for the contest,” Kerlin confesses. In 2012, Meredith, then nine, insisted on taking Nipper’s advice, and Kerlin encouraged her to make a cake from scratch. The children’s division had been eliminated, and Meredith’s creation, “The Best Chocolate Cake Ever” took the top prize overall for cakes. Most recently, Kerlin entered the contest and she, too, was awarded first place, this time in the pie division. Kerlin’s winning recipe, “I Love Peanut Butter Pie” features Reese’s Cups and can be found at www.hersheys.com/recipes/recipe-details.aspx?id=8265. Who will win in 2014? Maybe big sister Katie — or little brother Nathan. Both have become experienced bakers, and can make both cakes and pies (including crusts!) from scratch.